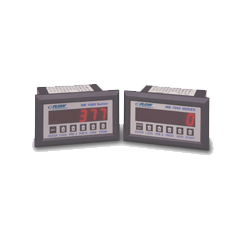 The MR and MB 1000 displays are miniature panel mounted Rate/Totalizer displays for use with turbine and positive displacement flowmeters. The MR1000 has two pulse input channels enable it to handle add/subtract and quadrature inputs, in addition to standard single channel input. The MB1000 has two relay outputs that provide batching capabilities in a very compact package.